There must ba a school for trafficgirls. Is there any info about it anywhere? That's a great picture, where ever it came from! There must be a Traffic Girl School. I wouldn't be surprised if they're considered a para-military force. 6. See 1 and 5 again. There's probably a lot of "party" benefits to being a traffic girl. Too numerous to mention here. I'm sure being a traffic girl is considered a very prestigious assignment, the school must have lots of applicants. It would appear that only the prettiest ones are accepted. I think there would be 5 basic requirements, besides possibly having to pass an ideological exam, that they must have before being accepted to traffic school: they must have 20/20 vision, be relatively tall, attractive, not overweight, and be resistant to spin vertigo. Anything else could be taught in training. As for schooling, in addition to the requsite studies of both the Great Leader's teachings and the Dear Leader's inspirational quotes, they probably are issued a lenghty Traffic Girl manual for studying, after which they must first pass written tests dealing with mundane things like traffic circle dimensions, baton length, hand signals, right of ways, uniform dress code regulations, Government vehicle identification, etc. Then they must be taught and drilled for precision marching, baton exchange, pirouette technique including snapping of the feet back together, proper arm angles and baton wielding, whistle usage, etc. I can imagine that there is an outside training ground at the school compound complete with streets and intersections in differing configurations such as a one lane street intersecting with a one lane, a one lane with a two, a two lane with a two, T intersections, Y intersections, etc. While using the training ground they would practice dealing with various traffic scenarios, with the students alternating training in the traffic circle with being the "traffic" and driving the cars. There are probably many common standard traffic situations they would be drilled on, and as time goes by the more proficient the trainee becomes, the more complex the traffic situation she is presented with. Finally, after several months and when all their training is finished, there would be a graduation ceremony held in front of a bleacher filled with family and friends - probably at the training ground - where they would be presented with the official Traffic Girl diploma complete with fancy lettering and government seals all over it. 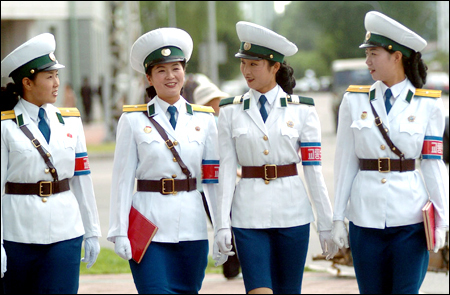 Lastly, they would then be issued their own tailor-made Traffic Policewoman uniform, which would come with a small leather clad box containing the shiny new Kim Il-Sung pin which they will proudly wear just above the left front pocket. LOL, I liked your description of what Traffic Girl school would probably be like. I also wonder how long does a career of a traffic girl last; it's probably not too long. Do they get promoted into some other job after a few years??? I'll bet a lot of the traffic girls are daughters or relatives of government big-whigs who use their priveleged position to get them in the school. No doubt that even in the workers paradise it's not what you know, it's who you know. I hear they are also the first to get married, so perhaps there's a course on how to get a husband included with their education ??? They're probably taught how to ignore guys whistling at them and trying to hit on them. They also might be trained as kind of a national guard, for when the inevitable American aggressor's invasion occurs. I'd like to see a picture of them marching in one of those North Korean army parades. If our horned-up American army guys ever came up against a batallion of trafficgirls, they'd be all but tripping over themselves trying to surrender. Can you imagine the traffic girls storming Pork Chop hill wielding those batons!? LOL - John Wayne would be shaking in his boots! If our horned-up American army guys ever came up against a battalion of trafficgirls, they'd be all but tripping over themselves trying to surrender. Yes, they're the DPRK's secret weapon. Those army uniforms look like clones of the Trafficgirl uniforms....except in a different color. I guess they get their fashions from one source only. Wow, imagine this - an army of cloned Trafficgirls. Sorry, my sci-fi geekiness is coming out. Well, we can dream about it, can't we????? together. i wonder how long do they train for. are they picked? or jusy apply willingly? Just a guess, but many probably apply and the lucky ones (or prettiest) are accepted.